Lons-le-Saunier is to the east of the Franche-Comté region, near Chateau-Chalon and Baume-les-Messieurs in the countryside south of Dole. Dating from at least Roman times, and with evidence of a neolithic settlement before that, the town has a long history. Unfortunately much of Lons-le-Saunier was destroyed by fire in the 17th century, so most of the buildings you see in the centre date from the following decades. 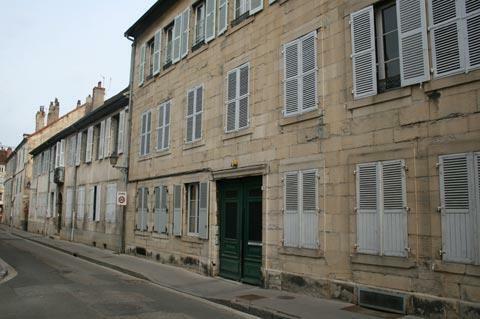 France This Way comment: although there is not a great deal to see in Lons-le-Saunier, it is pleasant to visit and merits a detour if you are nearny exploring the villages and scenery of the Jura. 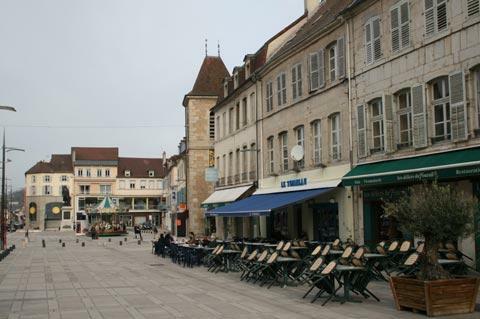 Lons-le-Saunier is based around the central Place de la Liberte, a large open square with fountains and statues. The streets that radiate from the square and are lined with 17th century town houses are the highlight - especially the Rue des Arcades. Note the clocktower on the same street, and also the birthplace of Rouget de Lisle, composer of the French National Anthem, the Marseillaise. 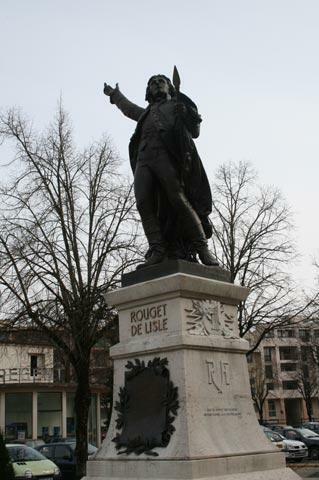 There is also a statue of Rouget de Lislein the Place de la Liberte. 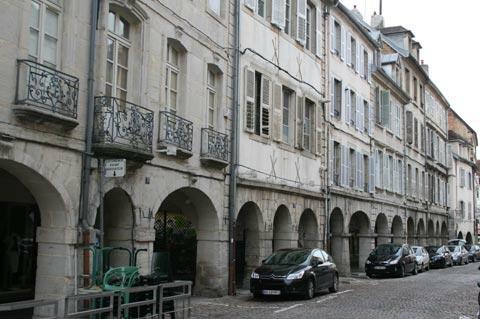 There are more townhouses to admire - see the 18th century properties in La Place Bichat, and the pastel-tinted colours of the less grand houses in La Place de la Comedie. You can visit the most imposing house, the Hotel-Dieu, which includes an arcaded courtyard, an imposing staircase and an apothecary to see. The crypt in the Church Saint-Eglise at Lons-le-Saunier deserves a visit as does (which is not always the case in small French towns) the museum exploring the history of the region. There is a spa if you need some rest and relaxation (apparently the town has been a spa town for the last 2000 years), and a good sprinkling of fountains around the town to remind you of its importance. You can also visit the Museum of Fine Arts in Lons-le-Saunier, which is very small but does contain some interesting sculptures and paintings. Within just a few kilometres of Lons-le-Saunier you can visit two of the most beautiful villages in the Franche-Comté region at Chateau-Chalon and Baume-les-Messieurs. Both are in very scenic locations and visits are highly recommended!